Current and former students at the Royal Conservatoire of Scotland, Graham Rorie, Aidan Moodie, Connor Sinclair and Craig Baxter have been tipped as “ones to watch” by Songlines magazine, for their lively, engaging and honest performances. The band originally formed in 2015, as a duo of Graham and Aidan, who had grown up playing traditional music together in Orkney. After winning a prestigious Danny Kyle Award at Celtic Connections, and reaching the semi-finals of the BBC Radio 2 Young Folk Award in 2016, they released their self-titled debut album. 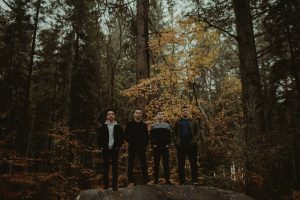 Now a four-piece, the boys released two debut singles -Waves and The Silver Fox – early in 2017; a year that also saw them nominated for Up and Coming Artist of the Year at the MG Alba Scots Trad Music Awards. Following the release of their EP, ‘Brother Wind’ in 2018, Gnoss will release and tour their hotly anticipated new album from spring 2019.